When playing Pot Limit Omaha, you must constantly be aware of the stack sizes of all the players around the table, and particularly those who get involved in a hand with you. When stacks are deep in relation to the current size of the pot, you can call a bet on the flop that you wouldn’t consider calling if the flop bet was all in or close to it. Alternatively, you should avoid calling some bets in certain deep stack situations. In a $5/10 blinds game you are in late position with QQJT. You call a raise pre-flop. Four players see the flop, and the pot is $120. You have $880 left in your stack, and the other players have about the same or more. You see a flop of T93, with two hearts (you don’t have any hearts). You have top pair with the ten, you have an overpair with the queens, and you have an eight-out open ended straight draw (QJ plus T9 on the board). The first player to act bets $120, and the other two fold. It’s $120 to you. 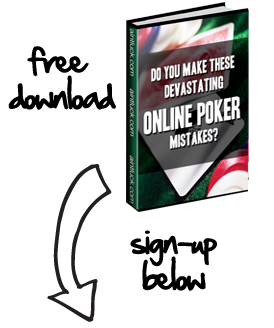 You have very few ways to improve your hand, and your made hand on the flop is quite weak. Anyone with as little as KK has you beat (for now). In PLO, we are looking for places we can get our stack in as a good favorite. This is not one of those times. If the other player has KQJ8 with two hearts, you are a 62-38 underdog to win the hand, even though you are currently ahead. Putting any money in this pot with a deep stack to back it up is a grave mistake. If the preflop raiser has aces but little else, like AA76 rainbow, you are only a 56-44 favorite to win this hand by the river. If that AA hand is a premium one, with QJ and a flush draw, you are now in huge trouble. Your opponent may not have anywhere near that good of a hand, but the simple fact is, you should not pay to find out. Wait for a better spot to commit yourself. If you miss your hand on the turn, are you going to call a pot-sized bet then? If a pot sized bet on the flop will get you or your opponent all in, or very close to it, you should be more inclined to bet or call all in on the flop with a made hand, despite the absence of redraws to improve. A pot sized bet never offers an opponent better than 2:1 pot odds, and much greater odds are needed to draw at eight or nine out draws. In deep stack play, calling is usually correct, because there are implied odds greater than 2:1. This means I can call a bet on the flop, getting only 2:1, if I reasonably believe that I can earn another bet on the turn if I make my hand. However, if a flop bet is all in, you are denying your opponent the implied odds to draw, and you can correctly get all in with made hands; even second set or a nut straight without redraws is usually enough. For more information regarding odds in Pot Limit Omaha, please read our Pot Limit Omaha Odds article.